Los Angeles and view toward lowlands. Opposite view to Lake Arenal mountains. Los Angeles is a small ranching center halfway between Canas, on the Interamerican Highway, and Tilaran, the commercial center of the Lake Arenal region, about 15 minutes from each. 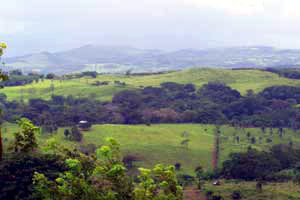 It has beautiful views over the Guanacaste lowlands that lead over the Rio Tempisque basin to the Pacific Coast. It is thus less hot than the lowlands but has less rain than do the hills around Lake Arenal. There are of course broad pastures covering much of the lovely hills, but many patches of forest decorate the hills and the area is rich with bird life. Pretty streams with forested banks also attract wildlife. As with all locations, more properties - particularly acreage in the form of fincas or farms - are available than we have listed here, and we can help you locate what you want. 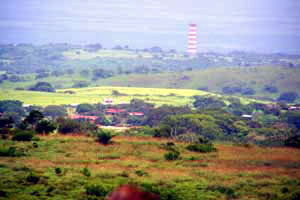 A105 26-acre finca with great vista, $300,000 or buy part.